Spain’s Supreme Court held a preliminary hearing on Tuesday ahead of the start of a high-profile trial of 18 Catalan pro-independence leaders over their role in last year’s failed independence bid. All the defendants have requested their case to be handled by Spain’s High Court in Catalonia (TSJC), as they argue that the Supreme Court in Madrid is not competent to judge them. A seven-judge panel is hearing from defence lawyers. The judges are expected to reject these arguments and to decide within a week. Defendants’ lawyers argue that all events took place in Catalonia, and therefore the accused should be tried there. Yet, they said that the Spanish judiciary is ‘interested’ in handling the case in Madrid. Lawyers denounce the violation of fundamental rights such as the right to the judge predetermined by law, as well as the right to appeal (as the highest court trying criminal cases in Spain, a Supreme Court decision can’t be appealed). ‘It’s not a matter of ordinary law, but one of fundamental rights,’ said Andreu van den Eynde, the lawyer of Junqueras and former minister Raül Romeva. The public prosecutor argued the case should indeed be tried by the Supreme Court because the goal of pro-independence parties was to ‘abolish’ the Spanish constitution. 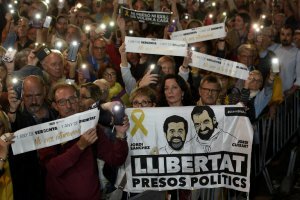 The sensitive trial is likely to start at the end of January or early February – more than a year after Catalan leaders in the northeastern region attempted to break away from Spain in October 2017 by staging a referendum despite a court ban. Of the nine defendants in pre-trial custody, four are three weeks into a hunger strike against what they see as their unfair treatment by the justice system. Prosecutors are seeking jail terms of up to 25 years at the trial that is set to last several months. France focus: ‘yellow vests’ – what’s next?